These allegedly haunted bed-and-breakfast inns will cause fright and delight. intro: Everyone appreciates a good haunted house during Halloween, which is why BedandBreakfast.com is highlighting five allegedly haunted bed and breakfast inns that are sure to bring fright and delight to their guests. These are great for those travelers who are intrigued by eerie apparitions and things that go bump in the night. 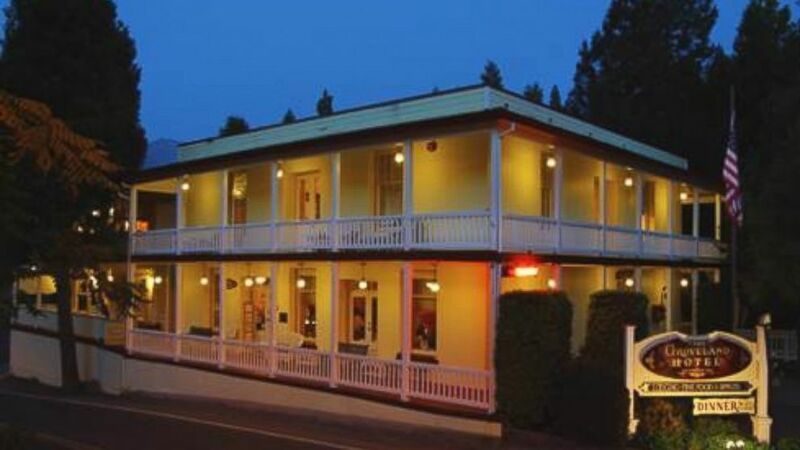 Check out these "haunted" bed and breakfast inns below! quicklist: 1 title: The Texas White House, Fort Worth, Texas text: His name was William Newkirk. "I've been told by a medium he likes to be called Bill," says innkeeper Cindy Lucio. "A medium also told me that he fell in one of the rooms and that's where he died." Bill's ghostly presence usually appears for solo female travelers. "She doesn't have to be single — just alone," explained Lucio. "When a guest is sitting on the bed, she'll feel the bed gently shift as though someone were sitting beside her. Or she'll feel someone walk past. No one's had a scary situation; there are no slamming doors or anything like that. He's evidently happy that the house is restored." One time, "the previous owners came back and found [their housekeeper] performing some kind of séance to get the 'evil' forces out of that room," said Lucio. 'No go,' said the owners. We want the spirits in the house! They bring us notoriety and guests!" quicklist: 2 title: Foley House Inn, Savannah, Georgia text: In Savannah, a place known as the most haunted city in America, there is no shortage of ghost stories tied to centuries-old historical inns. One of our favorite tales, of course, is about an innkeeper. The original owner of the Foley House Inn was Honoria Foley, a widow who rented rooms to travelers and boarders. According to legend, one night, a boarder attempted to strangle Mrs. Foley. Unable to scream, she grabbed a candlestick and beat him over the head. He fell to the floor and Mrs. Foley ran to another boarder's room for help. Returning to the bedroom, they discovered the man was dead. Fearing she would be imprisoned for murder, Mrs. Foley asked the boarder to help her conceal the body in return for free rent. On her death bed, she told friends what happened, but never revealed the location of the body. In 1989, during a renovation, a skeleton was found in a wall. The remains are believed to be the boarder that Mrs. Foley murdered, although they were never identified. Guests report seeing a man in a top hat walking around the garden late at night and hearing odd noises or feeling a strange rush of air. That's Wally (what locals call the resident spirit) making his presence known. Foley House is in the heart of Savannah's historic district — a good place to be if you're a ghost hunter. Even if you're not seeking a spirit sighting, the central location means you won't need a car during your stay. The innkeepers serve more than a hearty home-cooked breakfast; there are complimentary tea and sweets in the afternoon, as well as a happy hour every evening. quicklist: 3 title: Inn at 835, Springfield, Illinois text: Miss Bell Miller was a socialite, and by her mid-20s she had cornered a good portion of the Springfield floral market. (This was unusual for a single woman of the time.) She had greenhouses that lined the block and a parcel of land where, in 1909, she built the six-apartment building that's now a bed and breakfast called Inn at 835. Brian Tippy is the inn's administrator and "Chief Cat-Herder" and he's happy to share the space with Bell's spirit. "I believe that Bell hangs out here because she likes what we've done with the place, and she enjoys hosting guests from all over," he said. "We had a self-proclaimed medium say there were as many as 42 spirits here. That's doubtful. But Bell loved having parties, so maybe that's what was happening when the medium stayed." Tippy believes Bell is very much present. "She's not a scary or harmful entity by any means," he said. "Is this a hotbed of paranormal activity? I don't think so. Is the house occupied by the spirit of the person who built this home as the feather in her cap? It's possible. It doesn't hurt that we have an event facility; that way Bell can host parties any time she wants." The 13-room Inn is on the National Register of Historic Places. All rooms have private baths, luxury amenities, and period furniture. The property is close to the Lincoln Home, the State Capitol Building, and many of Springfield's historic attractions. quicklist: 4 title: The Groveland Hotel, Yosemite National Park text: "There was an old gentleman up here by the name of Ernie Beck — he knew Lyle," says Peggy Mosely, innkeeper at The Groveland Hotel. "He's the one who told me most of Lyle's story. And you know, I do not know his last name; he's always just been Lyle." Lyle worked at one of the local mines and he lived for a time at the Groveland. He passed away at the hotel, and he was found with a box of dynamite under his bed. "Tools of the trade," said Mosely. "He liked it so well, he keeps hanging around." Lyle is a little mischievous, but he's not harmful. "He doesn't like women's cosmetics on his dresser; he's knocked them onto the floor or moved them," said Mosely. Guests have stories about seeing Lyle. One couple said that as they were just about to doze off to sleep, a tall, slender bearded character walked past their bed, looked over his right shoulder at them and disappeared into the wall. Lyle's room is denim-blue and white. "Since he was an old gold miner, we figure he probably wore denim. When we're redoing rooms," says Peggy, "We always redo his first; we want to keep him happy." The Groveland is located at the gateway to Yosemite National Park on Highway 120. The Cellar Door Restaurant, on site, has a fully stocked bar with an impressive wine list, and the rooms have plush feather beds and fireplaces. Don't be fooled by the antique details and deep history — the inn is very modern and even has a Tesla charging station. quicklist: 5 title: Strawberry Creek Inn B&B, Idyllwild, California text: According to the California Paranormal Investigators group, the main house at Strawberry Creek — and one room in particular — is inhabited by a shy yet protective female figure named Jane, Janet or Jade (she's a bit vague on that subject). She appears to have been a Native American woman who was connected to the land before the house was built in the 1940s. The San Jacinto Mountains, where the Strawberry Creek Inn is located, was where the Cahuilla tribe of Palm Springs escaped the heat of the desert summers. While Jade (or whatever her name really is) doesn't often make herself known, she watches the house and her presence is felt by those who believe in her. The spirit has a big crush on Rodney, one of the innkeepers. Oddly, she doesn't seem to mind sharing Rodney with his partner Ian, although she has chosen to play a couple of lighthearted tricks on Ian. On rare occasions, she has also played mild pranks on guests. They've reported cold spots, and pictures in the cottage have been known to fly off the wall. Strawberry Creek is a gorgeous shingled home in the woods. Its grounds are certified by the National Wildlife Federation as an official Backyard Wildlife Habitat. Rodney is a cookbook author and Ian is a master gardener; their skills make for a property that's welcoming and full of thoughtful details.